Wow! What a windy afternoon both outside and in! The temps may have been up to the 60s, but the winds were not far behind with their gusts around 50. Those gusts blew right into the school making some students a bit stir crazy. During center time, I really was beginning to think I had a cluster of tornadoes in the room! They were so full of energy. Unfortunately, the kids weren’t the only ones affected by this wind. It is messing with the technology currents too. Really! You see, I was texting my daughter, and when I hit “SEND” the wind whirled the letters around making a mess of my message. As I re-read what I sent I saw that it was most definitely not what I had typed. Here are just a few of the changed words in my message: ‘new’ changed to ‘dig’, ‘had’ changed to ‘ad’, ‘orneries’ changed to ‘orneriness’, and ‘separated’ changed to ‘deprecated’! I truly was surprised she figured out what I was saying. This wind is messing with me, too. I have so many exciting projects I’d like to work on that I’m having a heard time prioritizing them. I have actually been making a little progress in three areas this week. 1.) I have been making a quilt which has been a slow process for me. It has taken me much longer than it should, but I am just about ready to sandwich the batting between the back fabric and quilt top. Who wants to come for a quilting bee? I will give a full account of this at a later date. 2.) Hubby and I are making some changes in our farm accounting and management. I successfully upgraded our software and am now figuring out how to implement some of the record tracking Hubby has requested. 3.) 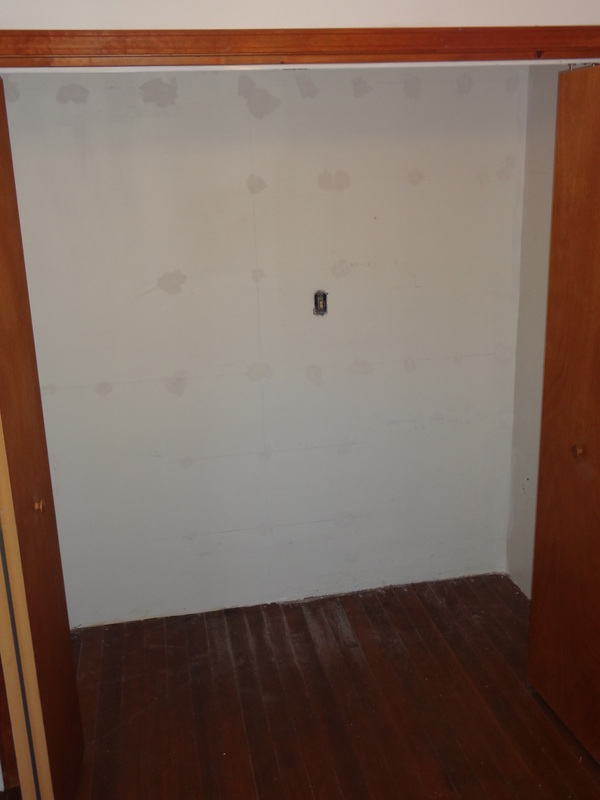 I began my first 2013 organization project – a closet transformation. Just about every January, I get this strong urge to get organized and fix things. 2013 is no different. In my old farm house, closet and storage space has not been abundant. However, now that my children are grown and have their own homes, I have 3 nearly empty closets! I have always loved to make things, whether sewing or crafting, but had to drag supplies out to the dining table to work. Because of the hassle, I have not done as much in the past several years as I’d like. Well, a dream plan has emerged. I am turning a bedroom into my sewing/ craft room. Of course, it still needs to be able to be a bedroom for guests so…. I am making a closet transformation. This is my progress…. I know. It doesn’t look like much, but I do have it all emptied out and the holes patched from the wire closet organizer! Hopefully, by next weekend I will be able to give you an update. In fact, my goal is to have the job complete!! Although the wind may be blowing outside and in, find a few quite moments to catch your breath, regroup, and be still. You’ll be glad you did. It is amazing how 5 or 10 quiet minutes can re-energize and re-focus.